Cruises from Dover depart year-round. Dover serves as a port for London, which is about 80 miles to the west. 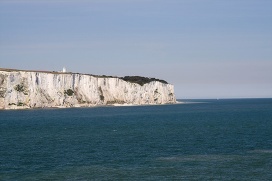 Dover is home to the famous White Cliffs of Dover, which are a historic symbol of British pride. Visitors can also see fairy tale castles and imposing fortresses by the sea, explore a Roman house or see a real Bronze Age boat in a high-tech gallery. The Port of Dover is located approximately 110 miles from London's Heathrow Airport (approximately 2 to 2 1/2 hours), approximately 85 miles from London's Gatwick Airport (approximately 1 to 1 1/2 hours), approximately 95 miles from London's Stansted Airport (approximately 2 hours) and approximately 80 miles from Central London (approximately 1 1/2 hours). From London traveling by car - Traveling by car, direct to the Cruise Terminals you are advised to travel on the M20/A20. The Dover Cruise Terminals are extremely well sign posted. For your information "M" stands for Motorway which is the same for freeway and an "A" is similar to a highway. Using Public Transportation from London Gatwick International Airport - There is no direct rail service from London Gatwick to Dover Priory station. There are two options for travel by rail, both options involve at least one change. The first option is travel via Tonbridge; the journey time is approximately 2 hours. The second option is via London Bridge and the journey time is approximately 2 1/2 hours. Generally this service operates on an hourly basis. Please check local train schedules to confirm departure and arrival times. On arrival at Dover Priory you will need to take a taxi to Dover Cruise Terminal Two, the terminal is approximately 5 minutes from the station subject to traffic conditions. Using Public Transportation from London Heathrow International Airport - Take the Heathrow Express to London Paddington Station. This service currently departs every 15 minutes and the trip takes 15 minutes. On arrival in Paddington, transfer to London Waterloo East by taxi; once there take a direct service train to Dover Priory Station. On arrival at Dover Priory you will need to take a taxi to Dover Cruise Terminal Two, the terminal is approximately 5 minutes from the station subject to traffic conditions. A regular service operates to Dover and the journey time is approximately one hour and fifty minutes.